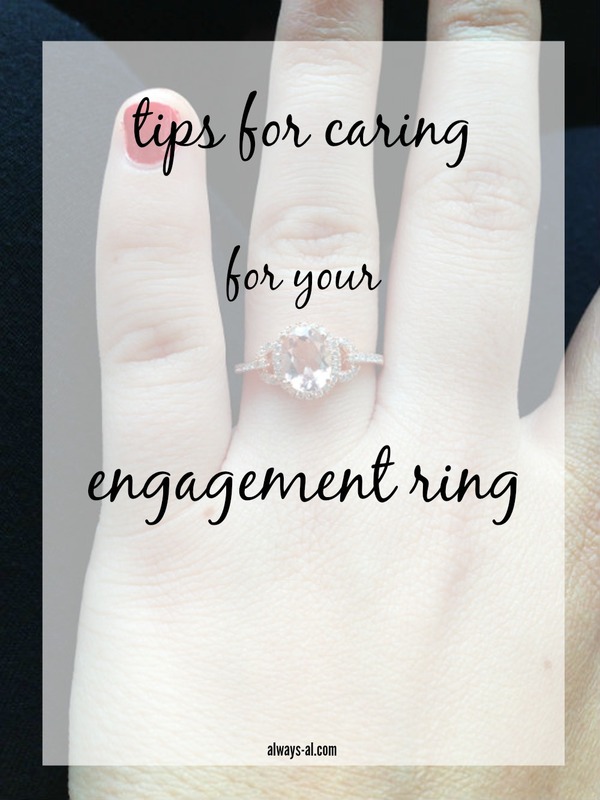 I have been wearing this fancy piece of bling on my finger for almost a year now, and over those months, I have collected and figured out a couple of really helpful tips to care for my engagement ring. 1. Make sure to purchase some sort of insurance or warranty plan. Most jewelers will offer some sort of warranty plan, and I highly recommend getting this. I have had to have my ring re-sized twice since we have been engaged, and without the warranty, this would have cost a fortune. These plans also usually cover routine maintenance, inspections and cleanings. 2. Take your ring off when you are doing things that could damage it. This includes things like exercising, cleaning and sometimes cooking. This is most likely the most precious piece of jewelry you have (it sure is for me!) and the last thing you want to do is get it damaged on some weights, or clouded by cleaner. Even though gemstones are a very resilient material, gold is not. 3. Keep your ring clean. While there are many store bought cleaners out there, I've found the best way to clean my ring is with a little bit of toothpaste and an old toothbrush. Brides.com wrote an excellent article on how to keep your ring clean and sparkly. 4. Wear it with pride. Your fiance picked out a fabulous piece of bling for you to wear, so you should flaunt it! Everyone's rings are different. Some people have huge diamonds, some have colored stones, some have tattoos--they all mean love! Linking up with Wedding Wednesday and Wine'd Down Wednesday. As a wife of 10 years...these are great pieces of information. You are so excited when the proposal happens and focus on the ring so much, until the planning comes. And with such a delicate piece of jewelry it can very quickly be damaged. I love these tips. I'm definitely going to have to try out that toothpaste method! Great tips! I have the warranty plan through the jeweler, but I am terrible at taking it off when I work out. I am so afraid I will lose it or forget to put it back on that I almost never take it off. Thanks for the tips! I take mine off at the times you mentioned, but the metal still needs a good cleaning. I will have to give the soapy warm water solution a try. Thanks for the tips! I take mine off while doing dishes or anytime I'm using harsh chemicals, but I still need to give it a polish every now and then. Luckily, most jewelry stores will clean your rings for free so I try to take advantage of that whenever I can. I feel like people get so caught up in wearing their new bling everywhere that they don't think about the daily wear and tear, or that you sometimes need to have it looked at! You definitely need a cute ring dish. I take mine off at night, and put it in my little ring dish, and I always know right where it is. That and soapy water with the toothbrush! Yes! And if not, many jewelers will clean them for free too! I love when you get your ring back from the store and it's so sparkly! Any time I'm at the mall, I stop at Kay and have them do their inspection and run it through their cleaner, as well - I just love how it glitters in the light after it's been cleaned by the pros!! Thank you!! I haven't cleaned mine yet but good to know. I definitely take mine off when I'm doing rough stuff! I just got engaged in January, so I'm always hyper-aware of my ring and super careful with it...it's like I'm always looking at it to make sure it's still there! Awesome tips. I need to do that more often! I always forget that that service is free! Thanks! I feel like I am so conscious of it right now, but its my most special jewelry! I know! Even though it fits well, I'd be afraid it would get dirty or broken or god forbid fall down the drain! These tips are so easy to implement!